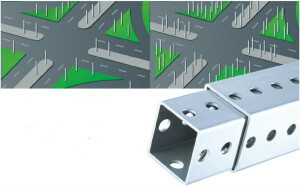 The Telespar sign post system consists of square, perforated, welded steel tubing, in eight sizes and three gauges. Perforations or knockouts on all four sides allow you to mount signs on all four sides, back-to-back, and on adjacent sides. The unique manufacturing method used to produce Telespar sign post tubing permits tubular sections of different sizes to telescope into the next larger size making adjustment, reinforcement and splicing fast and easy. Telespar tubing’s square shape also provides superior windload capabilities and torsional stability. Telespar sign post tubing is complemented by a variety of compatible fittings, accessories, nuts and bolts, and simple installation tools, creating an engineered system of integrated parts. Part Number Tube Size (in) Wall Thickness (Gauge) Weight/Ft in Lbs. All part numbers above are available in Pre-Galvanized and Plain Steel, except the Qwik Punch. All parts (except Qwik Punch) are available in solid or perforated. Full line of anchors and sleeves are also available, contact Unistrut Midwest for more information! 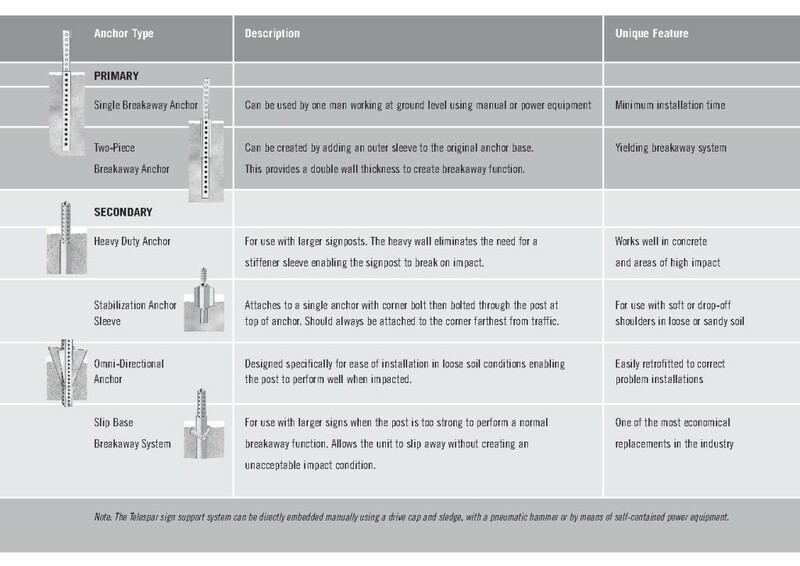 Lock Pins– Gravity lock pins provide a quick, temporary connection between telescoping tube sections. If you think square posts cost more than U-Channel, then you’d better look again. 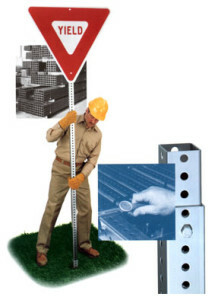 Cut Down on Installation Time- Typical square sign post installations require 1/2 the materials of U-Channel posts. which reduces the installation time in half and can save a good deal of money on labor costs. Safer Installation- All procedures in a Telespar installation are done at ground level (No more ladders or Hi-Lifts Needed). Telespar can be safely and easily erected by a single worker.